Heat the butter in a skillet over medium heat. Add the onion, thyme and a little salt and pepper. Cook until the onions begin to get soft, about 15 minutes. Turn the heat up a little, add the brown sugar, and cook until the onions turn golden brown; another 5 to 10 minutes. Adjust the salt and pepper to taste. Toast the bread on both sides in a toaster oven, under the broiler or on the grill. While the toasted slices are still warm, rub the top side with garlic and drizzle with extra virgin olive oil. 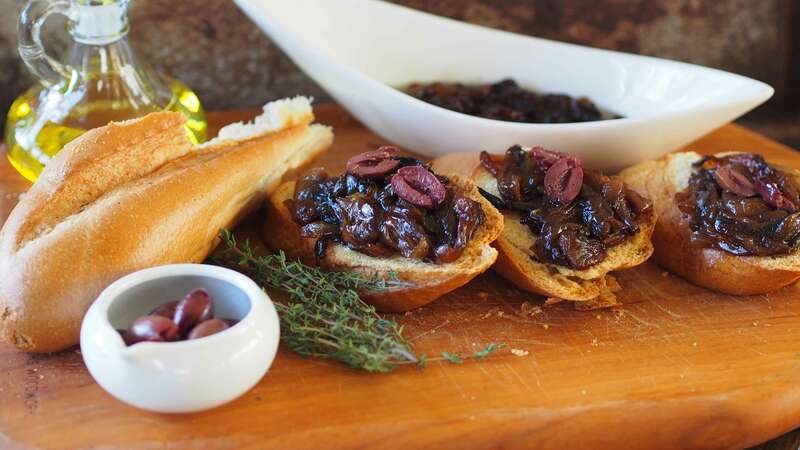 Place a dollop of the caramelized onions on each slice of Bruschetta and top with 1 to 2 of the halved olives. Photo and food styling by Webstop.